Pressure wasn’t a problem for Premier Stakes winner Daniel Blundell . . . but he did admit to a few nerves as he waited for the last two combinations to go in the jump-off. Blundell guided Athena NZPH to a win the class which holds a special place in the hearts of many because the winner is also awarded the Tom Gadsby Memorial Trophy. The trophy is presented by the Gadsby family in memory of their eventer and showjumper son Tom, who died while eventing in 2013. Twenty-seven-year-old Blundell was rapt with eight-year-old Athena NZPH, but he almost didn’t bring her to the show. 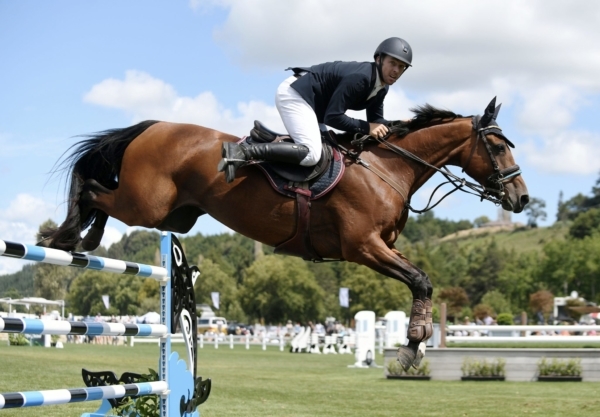 “She’s had half the season off with an abscess and I wasn’t going to bring her but she jumped so good at Takapoto Estate Show I changed my mind,” said the Auckland-based rider. He’s had the horse since she was five and brought her carefully through the grades. The Premier Stakes win is a career-best victory. Twenty-four combinations started the class, with just Blundell and teen Annabel Francis on La Quinara finishing the first round with clean slates. Nakeysha Lammers and her homebred Resolution all the rails up but had a single time fault. Seven combinations with four faults and less came back for the second round where Lammers piled the pressure on the field with a lovely clear, however Blundell rose to the occasion to take the class. Premier Stakes as part of the Dunstan Horsefeeds and Equifibre Horse Gran Prix Series: Daniel Blundell (Auckland) Athena NZPH 1, Nakeysha Lammers (New Plymouth) Resolution 2, Annabel Francis (Canterbury) La Quinara 3, Nick Brooks (Cambridge) Versace C 4, Drew Carson (Putaruru) Winston V Driene 5, Nicola Hammond (Cambridge) Carlo I 6.